Have you noticed that many parties today are family affairs? This means the hosts have to worry about entertaining not only other adults, but their offspring (and maybe their parents) as well. While it's great to be able to spend even more time with our kids and our friends' kids at family parties, more bodies (regardless of size) mean more work. You could make your affair "adults only." But sometimes it's fun to include the whole family. Plus, sitters can be difficult to find, especially during the holidays. So your job is to plan a soiree where people of all ages will be comfortable, entertained, and safe. It's easier than you might think. Here are a few ideas for safe, fun, and successful family parties. Most adult parties are boring for kids. No clowns. No balloons. They just don't get what we enjoy about talking to each other over a glass of wine or a martini and nibbling smelly shrimp and cheese. Remind your children that parties are grownup events and we must use prim and proper behavior. No running. No loud voices. No roughhousing. Pretend that you are a prince or princess for the evening. Make sure your house number is clearly visible. Clear sidewalks and porches of kids' toys or anything someone might trip over. Make sure the entry is well lit. Inside, make sure there is a clear, well-lit walkway that someone in a wheelchair or with a walker could navigate safely. Take up slippery area rugs. Mark any changes in floor level with plants or furniture. Place fragile and irreplaceable items on a high shelf or the fireplace mantel. Hang precious ornament high on the tree. Put breakables on higher shelves. Anything that can be bumped off or into and broken will be. Move delicate possessions to higher ground until the pint-size stampede is over. Do not leave lighted candles unattended in bathrooms or anywhere little hands might reach during party time. Fireplace candles or lighters go atop the mantel, not alongside the firewood in easy reach. Put all pets away for the evening. Yeah, they're cute, but dogs and cats can get nippy when mauled by 2-year-olds. And more fragile animals like hamsters or birds could be injured. You'll also lessen the risk of someone accidentally letting the pets escape if you put them in a safe place during large gatherings. Set aside a study or den as a dedicated play area for kids. Equip it with a few toys, videos, computer games, coloring books, and crayons; anything that will entertain them safely. The kids don't have to stay there - that would be unsociable. But at least you've provided a kid-friendly environment where they can amuse themselves. Be sure to provide a separate teens-only space away from the little kids to make grumpy teens smile. If you can possibly find a babysitter for your party, hire one. Your neighborhood high schooler could probably entertain the mini-masses nicely for a few hours - at a bargain rate. It's well worth your investment. It might even save your carpet. If you really want an adult affair, but want to make it easy on parents who might not have regular sitters to call on, arrange for your sitter to watch the kids at one of your guest's homes (preferably nearby). If you're having a large party (such as a New Year's Eve gathering), it could even be a sleepover affair where guests pick up the kids the next morning. Just make sure your sitter/kid ratio stays at about one sitter for every five children. If you have more than five kids, hire two (or even more) sitters. If you absolutely cannot find a sitter (try very, very hard), suggest that parents take turns supervising the kiddie tables. Most kids will actually prefer to have their own table in another room, especially if you let them watch a video, and at family parties, I certainly would. Prepare food for all: include some plain low-fat foods that have little or no salt. Regardless of your theme, make it easy for people with allergies, on diets, or simply finicky-eaters, to find something to munch on. What could be worse than having a guest leave hungry? Make a few kid-friendly foods, too: such as carrots, cheese, Goldfish, peppers, popcorn, and pretzels. 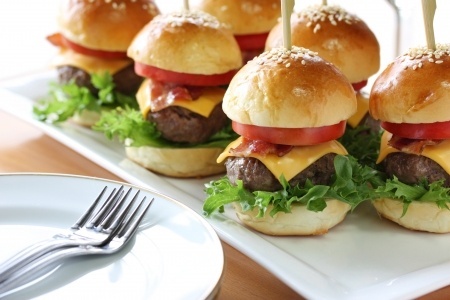 If you're having a dinner party, a good bet for the kids would be grilled chicken, stovetop mac and cheese, cheeseburger sliders, or cheese pizza. Even if you're planning a stand-up cocktail party, you should always have a few seats arranged in small cozy groups. This makes conversation easy and audible. And it provides a restful place for those who can't stand for long periods of time. One way of keeping the kiddies happy is to give them each a little gift. It amuses them for a while, and their parents will love you. It's one of the easiest ways to ensure parties are a hit with everyone. Now you can relax and enjoy your party, knowing you've done all you can do for all of your guests.